The Double, written in Dostoevsky's youth, was a sharp turn away from the realism of his first novel, Poor Folk. The first real expression of his genius, The Double is a surprisingly modern hallucinatory nightmare in which a minor official named Goliadkin becomes aware of a mysterious doppelgänger-a man who has his name and his face and who gradually and relentlessly begins to displace him with his friends and colleagues. In the dilemma of this increasingly paranoid hero, Dostoevsky makes vividly concrete the inner disintegration of consciousness that would become a major theme of his work. The Gambler was written twenty years later, under the pressure of crushing debt. It is a stunning psychological portrait of a young man's exhilarating and destructive addiction, a compulsion that Dostoevsky-who once gambled away his young wife's wedding ring-knew intimately from his own experience. 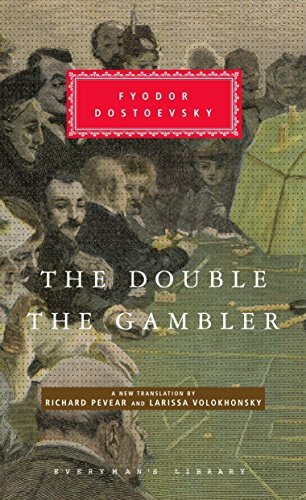 In the disastrous love affairs and gambling adventures of his character, Alexei Ivanovich, Dostoevsky explores the irresistible temptation to look into the abyss of ultimate risk that he believed was an essential part of the Russian national character. 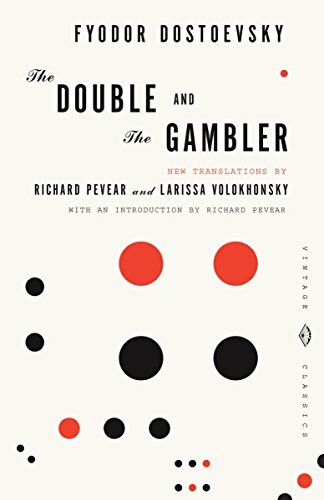 The two strikingly original short novels brought together here-in new translations by award-winning translators-were both literary gambles of a sort for Dostoevsky. About the Translators: Richard Pevear has published translations of Alain, Yves Bonnefoy, Alberto Savinio, Pavel Florensky, and Henri Volohonsky, as well as two books of poetry. He has received fellowships or grants for translation from the National Endowment for the Arts, the Ingram Merrill Foundation, the Guggenheim Foundation, the National Endowment for the Humanities, and the French Ministry of Culture. Larissa Volokhonsky was born in Leningrad. She has translated works by the prominent Orthodox theologians Alexander Schmemann and John Meyendorff into Russian. Together, Pevear and Volokhonsky have translated Dead Souls and The Collected Tales by Nikolai Gogol, The Complete Short Novels of Chekhov, and The Brothers Karamazov, Crime and Punishment, Notes from Underground, Demons, The Idiot, and The Adolescent by Fyodor Dostoevsky. They were awarded the PEN Book-of-the-Month Club Translation Prize for their version of The Brothers Karamazov and of Tolstoy's Anna Karenina, and their translation of Dostoevsky's Demons was one of three nominees for the same prize. They are married and live in France.